Guava Iced Tea is the perfect drink for a hot summer day. A simple and easy Guava Iced Tea recipe made from fresh, ripe Guava and a homemade simple tea syrup. This totally refreshing Guava Iced Tea is full of fresh Guava flavors. You can make this delish tea with just four simple ingredients. Warmer weather is arriving and iced tea is a wonderful spring and summer drink. Fresh brewed tea with added flavors from a simple syrup always makes for a great drink to serve up when the sun is shining. Guava also known as Peru/Jamfal/Amarud in India, it has lots of name. It is very easily available in whole year. In particular, I love guava fruit as it relates to my childhood memories. Actually, there was huge tree of guava in my grandparents’ house backyard. It was a huge tree and on season, and always fully loaded with guava fruit. At that time, I used to eat this fruit fresh direct from the tree, just cut it and sprinkle some salt and chilli powder over it, and that’s it, eating strait a way from nature… yummy…still I love to eat this fruit that way. Guava is very helpful for those who want to lose weight without compromising their intake of proteins, vitamins and fiber. Guava is very high in roughage and rich in vitamins, proteins and minerals, but it has no cholesterol and a low number of digestible carbohydrates. It is a is very filling snack and satisfies the appetite very easily. 1. Take a sauce pan. Add one cup of water and guava cubes, then boil it for 5-6 minutes on medium flame, let it cool down. 2. Once cool down then add the prepared guava mixture, strawberries into a juicer jar and blend it to make puree. Remove the prepared puree, strain it, discard the remaining part and keep aside. 3. Heat water into an another pan till boiling point. Add black tea, sugar and mix well, boil for 2 minutes. Strain it in a pitcher and let it cool down. Once completely cool, then add lemon juice and keep in fridge till chilled. 4. Lastly, mix the guava puree in the prepared lemon tea and mix well. 5. Take serving glasses, add ice cubes and pour guava tea. 6. Garnish with mint, lemon slice and serve chilled. • If you are using pink guava then no need to add strawberry. • You can use readymade frozen guava paste or guava nectar instead of Guava. • You can add tea bag instead of using regular tea. • You can always use sugar as per your taste. • You can use honey instead of sugar. Guava Iced Tea is the perfect drink for a hot summer day. A simple and easy Guava Iced Tea recipe made from fresh, ripe Guava and a homemade simple tea syrup. 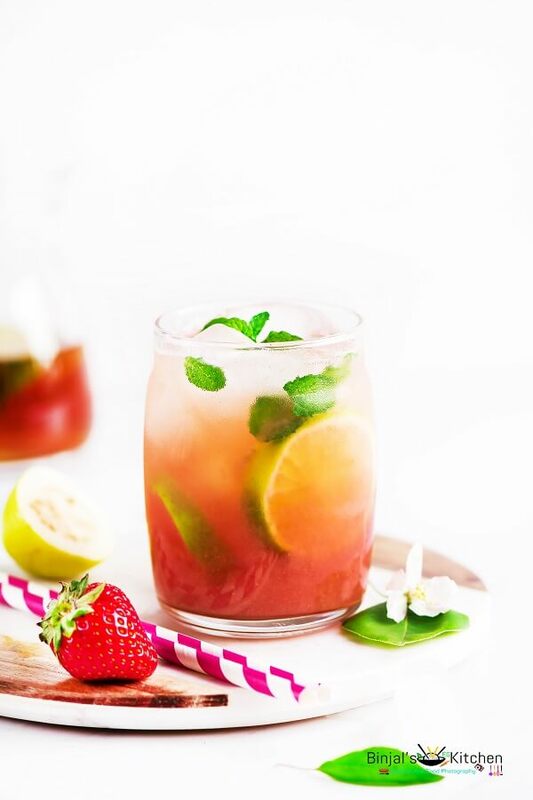 This totally refreshing Guava Iced Tea is full of fresh Guava flavors. You can make this delish tea with just four simple ingredients. Take a sauce pan. Add one cup of water and guava cubes, then boil it for 5-6 minutes on medium flame, let it cool down. Once cool down then add the prepared guava mixture, strawberries into a juicer jar and blend it to make puree. Remove the prepared puree, strain it, discard the remaining part and keep aside. Heat water into an another pan till boiling point. Add black tea, sugar and mix well, boil for 2 minutes. Strain it in a pitcher and let it cool down. Once completely cool, then add lemon juice and keep in fridge till chilled. Lastly, mix the guava puree in the prepared lemon tea and mix well. Take serving glasses, add ice cubes and pour guava tea. Garnish with mint, lemon slice and serve chilled. Guava tea looks so good .Fantastic captures binjal. What a refreshing drink Binjal. Gorgeous!